Novissima totius Terrae Sanctae Sive Promissionis Descriptio. An altogether stunning map of the Israel, Palestine, or the Holy Land. 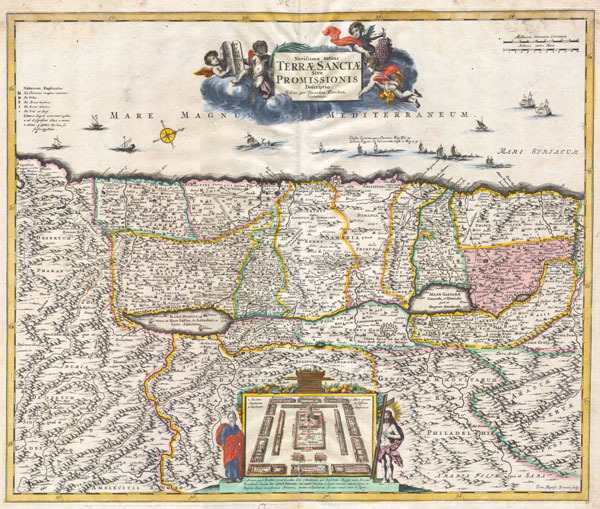 Issued in 1720 by David Funck of Nuremburg and geographically based upon Visscher's Map of 1659 and De Wit's Map of 1670. The shoreline runs from Sidon to Egypt along an East – West orientation. Divided according to the Tribes of Israel on both side of the River Jordan. Bottom center features a plan of the Temple of Solomon with the Ark of the Covenant featuring prominently. Moses and Jesus stand to either side of the plan. Title cartouche appears at the top of the map and features four cherubs, one of which holds the Tablets of Moses or the Ten Commandments. In the Dead Sea (Mare Mortuum) the destroyed cities of Sodom, Gamora, Sebim and Adama are depicted. At sea, 14 ships sail the Mediterranean. All text is in Latin. David Funck (1642 – 1709), also known as D. Funcken, was a Nuremberg book publisher, cartographer, and engraver. In 1679. he took control of the publishing house of Jacob von Sandrart to whose daughter, Magdalena Christina, he was married. Funck distributed books and prints to Frankfurt am Main and Leipzig from 1708. Johann Baptist Homann apprenticed under Funck until 1702. Very good condition. Vibrant hand color. Blank on verso. Good margins. Minor bucking of paper at top centerfold. Minor repaired separation extending one inch into the map, at bottom centerfold.